Laws are, for the most part, there to protect us as a society. But what about all those dumb laws out there that are STILL on the books, and nobody knows why (or how)? In case you've ever wondered what a dumb law looks like, we've compiled a list of state's DUMBEST laws for your satisfaction. And if you happen to live in in one of the states that these dumb laws exist in, don't say we never warned you! Behold, a look at the weirdest laws you might ever see. Click through and enjoy their craziness! In Alabama boogers may NOT be flicked into the wind. In Alabama it is illegal to sell peanuts in Lee County after sundown on Wednesday. In Alaska, moose may not be viewed from an airplane. In Alaska, owners of flamingos may not let their pet into barber shops. In Alaska, persons may not allow “attractive nuisances” to exist. In Arizona, a decree declares that anyone caught stealing soap must wash himself with it until it is all used up. In Arizona, it is unlawful to refuse a person a glass of water. In California, you are not permitted to wear cowboy boots unless you already own at least two cows. In Delaware, getting married on a dare is grounds for an annulment. In Florida, you may not kiss your wife’s breasts. 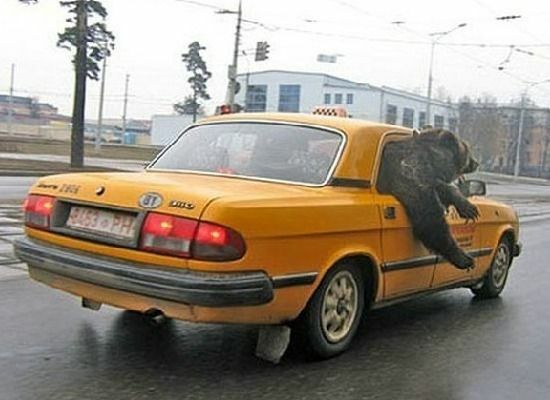 In Missouri, it's illegal to drive with an uncaged bear in your car. In Idaho, it's illegal for a man to give his sweetheart a box of candy weighing less than fifty pounds. In Washington, the harassing of Bigfoot, Sasquatch or other undiscovered subspecies is a felony punishable by a fine and/or imprisonment. Laws are, for the most part, there to protect us as a society. But what about all those dumb laws out there that are STILL on the books, and nobody knows why (or how)? In case you've ever wondered what a dumb law looks like, we've compiled a list of state's DUMBEST laws for your satisfaction. And if you happen to live in in one of the states that these dumb laws exist in, don't say we never warned you! Behold, a look at the weirdest laws you might ever see. Click through and enjoy their craziness!